In search of the aforementioned comfort food and calorie-packed booze, we found ourselves in the Porter Brook at the top of Ecclesall Road earlier this week. The Porter Brook’s exterior has an olde-worlde charm, and the interior has that cosy ‘local boozer’ feel you’ll be craving for the next few months. The atmosphere isn’t a million miles removed from the Nursery Tav at the other end of Ecclesall Road, although the Porter Brook does seem to attract less of a student crowd. Despite the lack of freshers, the Porter Brook was doing a brisk trade when we visited, so much so that even on a wet Wednesday afternoon we had to poke around a bit before we found an empty table. Once seated, we launched into the drinks menu. Bargain hunters beware, the Porter Brook may share the Nursery Tavern’s welcoming atmosphere, but the drinks are noticeably more expensive. After a quick bit of maths, we realised there wasn’t much difference between a round of beers and spirits, and a bottle of wine, which seemed like a good excuse to order a full bottle (£8.95) and make an afternoon of it. I needn’t have bothered with the side order. The vegetable tagine arrived promptly (in under ten minutes) and, it turns out that at the Porter Brook a £3.99 meal can fill you up. The tagine sauce had a rich, satisfying heat that warmed the pit of my stomach without burning my tongue, making it suitable even for non-heatseekers. Although there was more sauce than veggies, there was a good range of vegetables – onion, sweet potato, chickpeas and courgettes. Soaked in the warming tagine sauce, the chickpeas in particular were delicious. 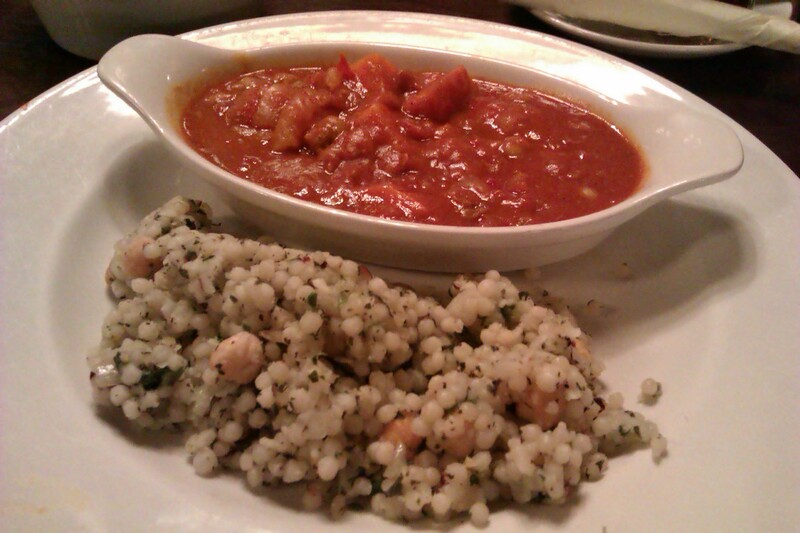 There were also chickpeas in the couscous, which made my bargain meal even more filling. Couscous is a very easy thing to overcook, but the Porter Brook got it just right and cooked my portion through, without turning it into slop. There were a few lumps of couscous that could have been broken up with a fork before being brought to the table, but when you’re getting a big plate of comfort food for £3.99, having to fluff your own couscous is no big deal. The vegetable tagine left me warm, stuffed and satisfied. The perfect winter warmer, and I can’t wait to have it again! Although I was full from my main meal, it would have been a shame to waste my side order and so I soldiered valiantly on. At £1.89 the Porter Brook once again get top marks when it comes to providing value for money. 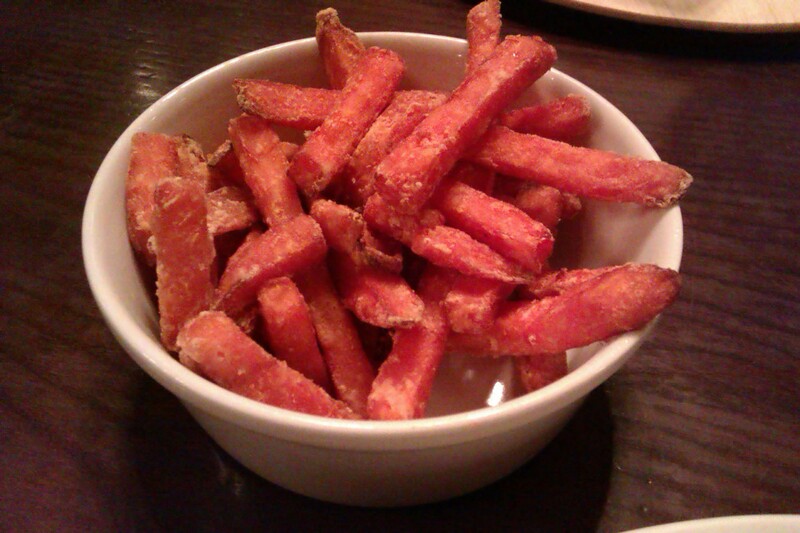 Warm, soft and sweet on the inside, these fries are the perfect addition to a winter warmer feast. They disappeared in no time. Also arriving at our table was some more traditional pub grub: a Mexican burger topped with pepper cheese sauce and jalapenos. 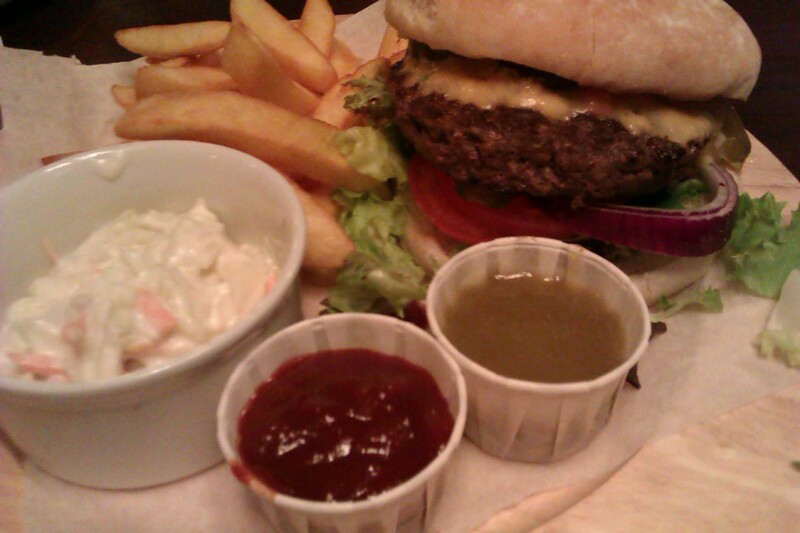 Served with coleslaw, fat chips and two dips for 6.99, the Porter Brook again proved themselves a generous establishment. The burger was nice and juicy, and the combination of pepper cheese sauce and jalapenos ensured this meal delivered the same satisfying warmth as my tagine. Our reviewer raved about the chunky coleslaw, but the jalapeno dip had a vinegary aftertaste, like it had been made from pickled jalapenos. The runny consistency and murky green colour is also enough to put fussy eaters off. After dunking a few chips into the sauce to try and decipher what the sour aftertaste could be, we gave up and the dip went unfinished. The Porter Brook is a cosy venue with a welcoming ‘local boozer’ feel that’s often missing from the bustling Eccy Road. It clearly draws quite a crowd and it’s easy to see why, the food is value for money and good quality pub grub (just what you need, in this grim weather.) The drinks are on the pricey side, so it’s worth scouring the menu for deals or sharing a bottle of wine between a table. Sinking a couple of vodkas or pints with your meal will seriously push up the bill – you have been warned! Highly recommended if you’re after a plateful of good old fashioned comfort food to combat the chill.